Cool name? Check. Surprisingly competitive team? Check. The league's top cornerback this year? Might be. So why isn't Alterraun Verner a household name yet? According to Pro Football Focus, the 2010 fourth-round pick from UCLA is the NFL's best corner through five games. Quarterbacks have thrown at him 28 times; Verner's allowed nine catches for 159 yards and zero touchdowns. To compare, Revis has conceded 12 catches for 102 yards and a score on 22 targets, and Sherman's given up 14 receptions for 258 yards and a touchdown on 26 targets. His past two games have been nearly flawless. Against the Jets, Verner didn't allow a completion on four targets and picked off Geno Smith twice, earning AFC defensive player of the week. 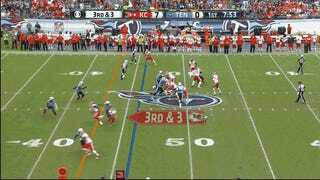 In the Titans' loss to the Chiefs on Sunday, Verner surrendered only one catch, although it was a 41-yard reception on a go route by Donnie Avery. 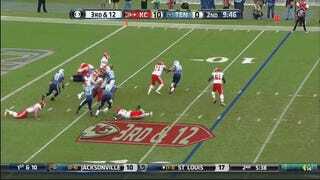 On two other plays we'll see below, however, Verner came very close to picking off Alex Smith. In the first quarter, Verner jumped an out route by Chad Hall but couldn't wrap his hands around the ball. It was still an excellent prediction on his part. This rushed, inaccurate bomb from Alex Smith would've been incomplete anyway, but Verner, sitting back in zone, again showed a knack for being in the right spot. Should we have seen this coming? In 2012, Verner barely cracked the league's top 25 at his position, allowing 53 catches for 556 yards and two touchdowns on 84 targets. Decent numbers, but far from shutdown. He also only racked up a pair of interceptions, a number he matched in his first two games this year. But what hasn't changed is Verner's knack for avoiding penalties—he drew a single flag all last season, and just one so far this year. 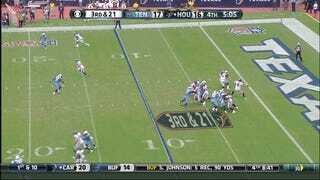 Verner's managed to get more aggressive—reading the QB, jumping routes—without becoming reckless. If the switch has gone on and Verner has finally made The Leap, it's good timing for him. He's in the final year of his rookie contract. If Verner can maintain this kind of play and be an elite first line of defense in a pass-happy league, he's going to cash in handsomely. By then, everyone will know his name.